One of the most confusing (but thankfully, rare) issues in this field is the difference between “void” marriages and “voidable” marriages. My understanding has always been that the former are no good, no matter what, while the latter can be made into valid marriages. But, I won’t bet that is correct! 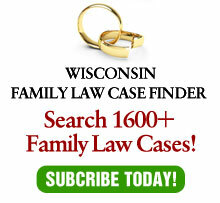 In any event, the Wisconsin Supreme Court will have the chance to clear up this issue since it granted review this week on a certification from the Court in McLeod v. Mudlaff, 2011 AP 1176 and 1177. The main issue is with whether, under Wis. Stat. §767.313(2), a court has the authority to entertain an action to declare a marriage void after one of the spouses has died. The facts are fit for a made-for-TV movie. In August, 1972, Nancy married Luke Laubenheimer. They never had children together, although Luke had three children from a previous marriage. Nancy executed a will during her marriage that left her estate to Luke or, if Luke predeceased her, to Luke’s three children. Nancy never updated her will after Luke’s death in 2001. In January, 2007, Nancy suffered a stroke and her health began to decline. Although it is unknown when Nancy and Joseph McLeod met each other, they were living together by March 2007, two months after her stroke. According to the certification from the Court of Appeals, on October 1, 2008, Nancy suffered another stroke. On October 11, 2008, Nancy’s doctors signed a “statement of incapacitation” opining that Nancy was “unable to receive and evaluate information effectively or to communicate decisions,” and that she lacked “the capacity to manage health care decisions.” The statement of incapacitation activated Nancy’s health care power of attorney, which named Nancy’s cousin as her agent for health-care decisions. In any event, less than two months after the wedding, Luke’s daughter Patricia Mudlaff filed a petition seeking guardianship for Nancy, alleging that Nancy “suffers from severe cognitive disability due to several strokes.” The petition alleged that Joseph had removed Nancy from the nursing home against medical advice and included an examining physician’s report dated that Nancy was incompetent and in need of a guardian. Nancy died on Feb. 5, 2009, just short of her three month anniversary. Back to the certification: A few months after her death, the grieving widower filed a petition for the formal administration of Nancy’s estate, requesting that he be appointed as personal representative of the estate. While Joseph filed Nancy’s 1999 will with the court, he asserted his right under Wis. Stat. §853.12 to a share of Nancy’s estate. Since Nancy did not have any biological or adoptive children, Joseph argued that he was Nancy’s sole heir. Patricia, apparently not appreciating the prospect of true love between an elderly incapacitated woman, apparently with financial resources, and a late-in-life companion apparently without resources, was not amused. She challenged the marriage as invalid on the grounds that Nancy lacked the requisite mental capacity to enter into a marriage. The trial court denied Patricia’s petition on the grounds that Wis. Stat. §767.313(2) prohibits a court from annulling a marriage after the death of a party to the marriage. Patricia appealed. The Court of Appeals certified the matter to this court. Now, I appreciate the policy reason behind not annulling a marriage after the death of one party since the evidence will be limited, but there has to be an exception here! I mean, if the facts are true (and I have no way of knowing that as I’m limited to the certification) how could the law allow Joseph to profit by a marriage to an incapacitated woman? There will be evidence as to Nancy’s medical condition as there were doctors who examined her. Plus, I’d be interested in who performed the wedding ceremony and his or her observations. In any event, the law makes decisions as to competency every day. There is no reason it cannot do so here. So, void it, voidable it, annul it — whatever. If the evidence warrants, the marriage should be deemed to have never happened since a marriage requires voluntary consent. I’ll post when there is an update on this case.